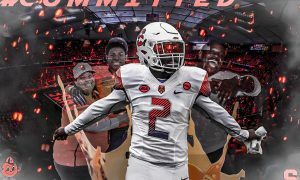 It’s a shame that this could be the way that Frank Howard’s college career could end. After having the most points in consecutive games in his career with 46, he’s suspended indefinitely. 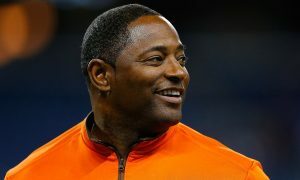 But I don’t think that will hinder this SU offense as much. 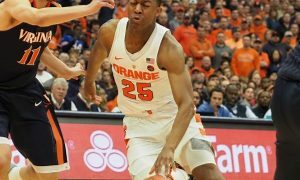 The return of Tyus Battle is far more important than the absence of Howard. I like the addition of Buddy Boeheim into the starting lineup with Battle running the point. 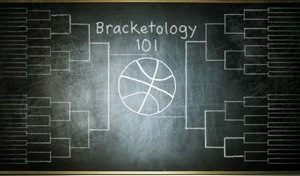 Syracuse is going to need shooting in the tournament and I prefer the option of Boeheim and Battle to open the floor. 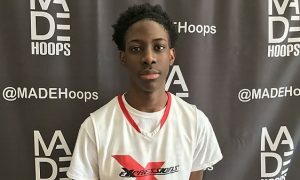 That can set up Elijah Hughes and Oshae Brissett to cut and drive to the basket. Rebounding is going to be a problem against one of the premier teams at attacking the offensive glass, but there’s not a lot of height on this Baylor team while SU is the tallest in the country. If Brissett and Hughes can rebound from their spots in the zone, the Orange should win comfortably. 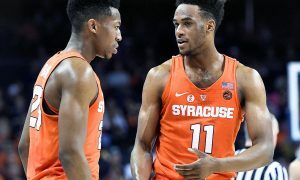 Syracuse is missing its floor general and senior leader. Baylor cleans the offensive glass as well as nearly any team in the nation, which presents a nightmare for Jim Boeheim’s zone. SU has dropped five of its last seven. I’m still going with the Orange, because I think they’re flat-out better. 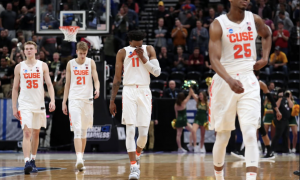 If you think the ‘Cuse is cold, try this on for size: Baylor hasn’t won since February 27, wrapping the regular season with three straight losses and bowing out of the Big 12 Tournament in the first round, albeit against a sizzling Iowa State team. The Bears crank the pace to a crawl even more than the Orange do (Baylor ranks 291st in tempo, compared to Syracuse’s 253rd, per KenPom) and score at a high clip (29th-best pace-adjusted offense in the country). 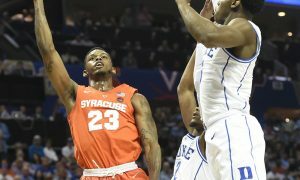 But the 2-3 can make even the most efficient offenses sweat, especially if they haven’t seen it in five years — the last matchup between these two teams came in November of 2013, when Syracuse won, 74-67, in Maui. Throw in the injuries to Makai Mason, Baylor’s best player who still might be feeling the effects of a toe issue suffered in early February, and Tristan Clark, Baylor’s second-best player who blew out his knee midway through the season, and I think the Orange are just good enough to slip past the Bears in game that looks like it’s played in slow-motion. And don’t forget about the ultimate trump card: Jim Boeheim vs. Scott Drew. Sorry, Scott. Sorry for being that guy. I just have a bad feeling about this one. The rebounding thing is really scary. Baylor is second in the country in offensive rebounding percentage. Not to mention, it just feels like Syracuse is due for a March letdown a little bit. The zone confuses teams in the tournament. There’s no denying that. 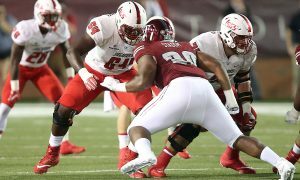 However, it’s less of a thing in the first round when teams like Baylor have a decent amount of time to prepare for it. 6’7 guard Mario Kegler (10.6 PPG) hurts Syracuse at the high post with his mid-range jump shot and Makai Mason (14.6 PPG) makes enough threes to give Baylor a second half cushion. In the end, the Orange fight like they have all season, but rely too much on jumpers down the stretch against a Baylor team that likely plays some zone defense as well. 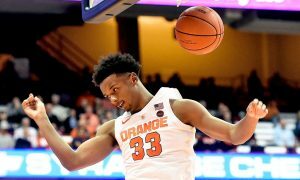 All I can say is thank goodness Tyus Battle is back if you’re an SU fan. 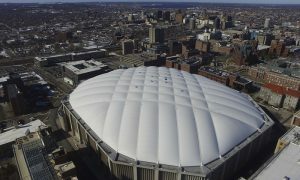 Can you imagine trying to play an NCAA Tournament game 2,000+ miles away from the Carrier Dome without your best player and your starting point guard? That probably would have spelled disaster for Syracuse, but luckily they’ll have their guy in Salt Lake City. 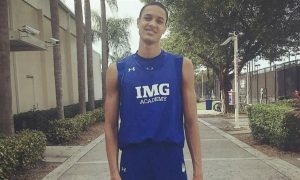 Battle will almost undoubtedly be the best player on the floor for either team and with Howard’s absence, he’ll also likely have the ball in his hands more than usual. 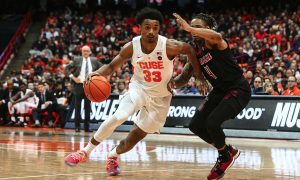 He needs to be effective both off the dribble and as a facilitator if SU is going to find success against the Bears’ 1-3-1 zone. As we all know, passing is the key to breaking down any zone and with Battle at the one, he’ll have to pull himself slightly off the score-first mindset that he typically plays with. 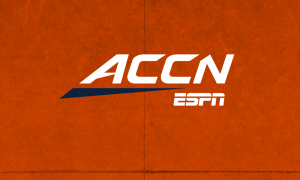 If Tyus plays like Tyus and facilitates the way he did in a couple of midseason ACC games (think a career-high 9 assists against Miami), then Howard’s suspension shouldn’t hurt too much in this opening round game, so long as the Orange can also keep the Bears off the offensive glass, which is a strength for Baylor and a weakness for the ‘Cuse. No Frank Howard, no problem. Right? Syracuse always seems to rally from spots like this. Not having a senior point guard is a big blow, but they’ve played without him in the past. 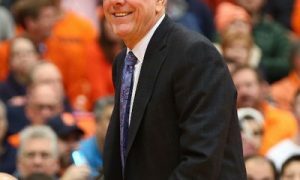 Howard’s absence means an expanded role for Buddy Boeheim, who was already seeing significant minutes. Tyus Battle is back and the Orange’s 2-3 will be primed and ready to go against a Big 12 opponent. 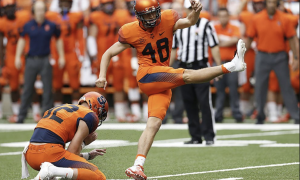 Expect Syracuse to rattle Baylor early on. If Battle is on his game, the Orange shouldn’t have a problem getting past the Bears. However, the following round might not be as easy. For the third time ever, and for the first time in the NCAA Tournament, Syracuse and Baylor play each other. 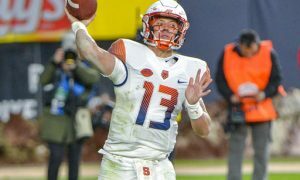 Of course, the Orange take a hit with the loss of Frank Howard, a recent revelation after he has improved his play in recent weeks. 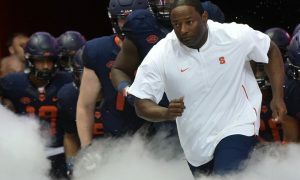 Fortunately for SU, Syracuse has more bench depth that it has in previous years, which helps cover for the indefinite suspension. 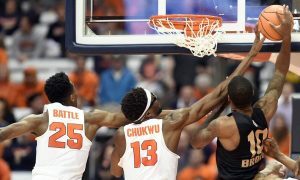 With Tyus Battle returning to the floor, the Orange should have a net improvement in performance from the ACC Tournament where they faired well without him. Meanwhile, Baylor has not won a game since February, and despite being just one seed behind SU, the Bears are facing a steep uphill fight. Syracuse has made nine of the last 11 NCAA Tournaments, dating back to the 2008-2009 season. Not one time in those nine trips to the dance has the Orange been defeated in the first game it’s played. This includes first-round upsets of 7-seed Dayton in 2016 – as a 10 seed – and sixth-seeded TCU just last year as an 11. 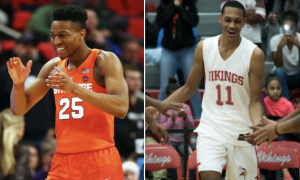 Those both came as part of runs – one to the Final Four and the other to the Sweet 16 – that Syracuse wasn’t necessarily expected to make. As an 8-seed this time around, the Orange again has a presumably tough road ahead as it aims for another run. 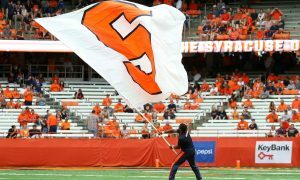 However, Syracuse will at least have the benefit of a higher seed against its first-round opponent, even if the edge is slight – something SU hasn’t enjoyed in five years. On the flip side, ninth-seeded Baylor has lost its opening game in two of its last three tournament appearances under head coach Scott Drew. Not making matters any better, the Bears also enter the dance stumbling a bit, losing four straight, and seven of their last 11. Assuming the Orange doesn’t come out looking how it did in its regular season-ending hiccup at Clemson back on Mar. 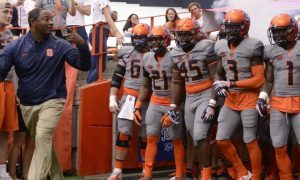 9, I expect Syracuse to keep dancing into the weekend. This is a nightmare matchup for Syracuse. Baylor plays a 1-3-1 zone on 40% of defensive possessions and the Orange have struggled all season against zone. The glass is a mismatch in favor of the Bears. SU has the eight worst rebounding percentage among tournament teams, while BU has the 9th best. I’m still going to go with the better team on this pick. Baylor is essentially the walking dead. They lost star center Tristan Clark for the season in February. 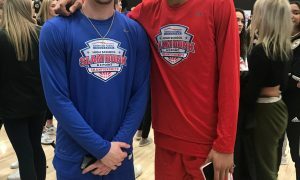 Point guard King McClure and leading scorer Mason Makai both missed extended time late in the season and are nowhere near playing their best basketball. The Bears have lost four straight games. 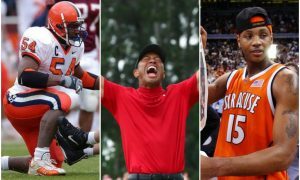 Syracuse has been playing solid basketball for a while now. 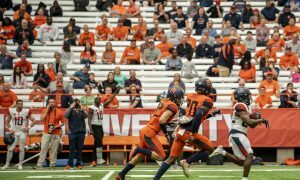 The bad matchup won’t be enough to stop Syracuse against a depleted opponent in the opener. Syracuse struggled down the stretch, losing five of its last seven. But four of those losses were to UNC, Virginia, and Duke who are all one seeds in the NCAA Tournament. Meanwhile Baylor lost its last four games and hasn’t been the same team since its second leading scorer, Tristan Clark went down for the rest of the season in January. That put even more pressure on guard Makai Mason, who shoots almost 37 percent from three. But the Yale transfer is averaging just 11 points in his past five games. 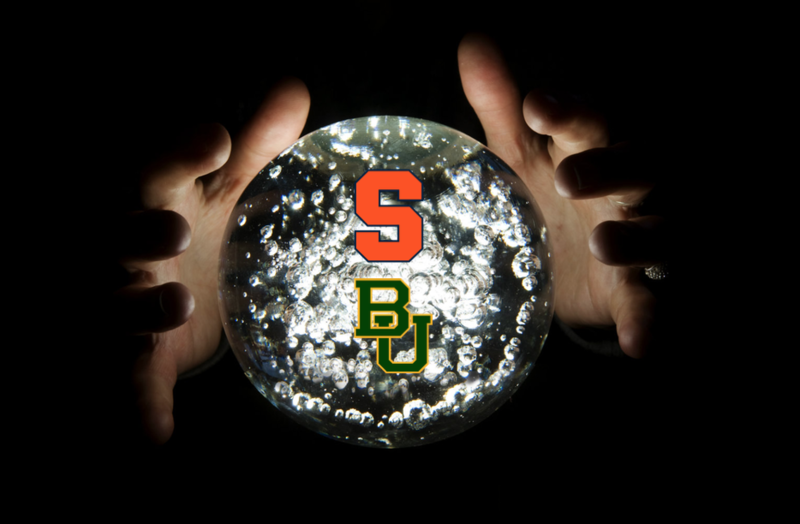 The biggest problem for SU will be Baylor’s prowess on the offensive glass. The Bears are 11thin the country in offensive rebounds, and the 2-3 zone is susceptible to easy put backs. But Baylor’s best rebounder, Mark Vital, is only 6-foot-5 and won’t grab boards over 7-foot-2 Paschal Chukwu. 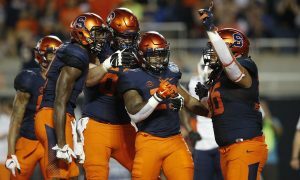 Syracuse cruises by Baylor on its way to a matchup with No. 1 seed Gonzaga.